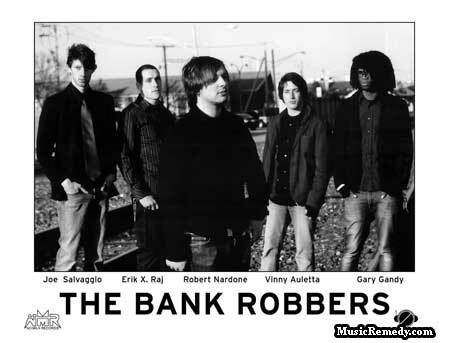 Well, somewhere between the hugging harmonies and popster love angles of Jimmy Eat World and the boyishly hard glee of the Ataris comes the well-zipped, rather mainstream pop rock of The Bank Robbers. At first, tracks like “Defending the Kingdom” come off as an odd balance between music for masses accessibility and rather venal love-bitten bitter lyrics: “We’re up to our necks in water/and I’m planning to get you under me.” Those sweetened vocals have a dark, ominous dagger hanging above them: the sexual need and kick-‘em-outa-bed mentality is rough guy stuff hiding beneath the mask of driftless emo boy blues. “Making Promises” continues the loner kicks and “boy about town” motif: “I am so alone in this cold town, don’t go away.” The guitars swirl and swell, the vocals pine and ebb, there’s even a nice break for acoustic serenading, but it all feels rather air-conditioned. In turn, “I Can Make You Disappear” aims for a tougher musical mile; the crunchy, roiling thick guitars drift into emo-ville, and the vocals go scratchy for a burst of alienation once again: ”I can’t stand this place anymore.” If you like punk shaped by prime time television style — all the anguish that can fit in the palm of a hand — then this is your code of honor. With a surprise visitation from the anti-diva Marianne Faithful on “Insylum,” her gravel voiced sorrow and madness reveals the larger palate of the band as they embody and disrupt the likes of Birthday Party, Tom Waits, Chrome Cranks, Gallon Drunk, and all the others who turned lounge music into a voodoo-witchcraft-black sorcery-mondo B-movie-Richard Kern-free jazz sonic spree befitting a David Lynch film. At times, singer Eugene Robinson is capable of true tenderness that unleashes mottled, seeping, and tone-poem pastoral music, but he is also equally adept at lunging, gesticulating notes of terrible beauty too — caterwauling intensity and molten self-horror. 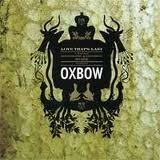 Hence, Oxbow’s patterns drink deep. The songs don’t serve their aims individualistically but instead gel, morph, and and lean against the soft elbows of each other, like front porch blues songs swept into hallucination-molded cinema. There’s a dry air around the sounds that surround listeners in immersive open room acoustics, so everything feels a little verite, a little unadulterated, and a little accidental. Even the quietness of “The Valley,” which for a slender moment feels like Mark Lanegan is at the helm, eventually just disperses into language dribbles. Secrets can’t be shared, it seems; incoherence and pathos seal the deal, and aloneness impregnates the chords. If you are looking for routine song craft sensibilities, don’t look here, unless you like to see the naked bulb of your expectations shatter under art bombs.